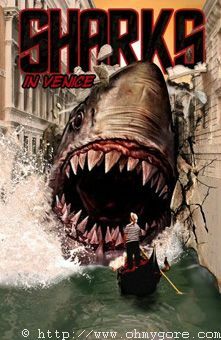 "SHARK IN VENICE" [DVD NEWS] - "SHARK IN VENICE"
[DVD NEWS] - "SHARK IN VENICE"
Just a week ago we was telling you about the mind-blowing trailer for "SHARK IN VENICE". This week we can tell you that not only does it now have a DVD release date set; the title has gained an extra "s". And get a load of that hysterical DVD artwork. First Look Pictures will be releasing "SHARKS IN VENICE" - an "s" has clearly been added for phonetic purposes since all indications are there is only one shark in the film - to DVD in the US on January 27th (pre-order it now!). Those living in the UK will get it next week, though the PAL DVD won't have that swanky comic book cover-worthy artwork we'll be getting over here in the colonies. "Traveling to Venice to investigate the mysterious death of his father, David, a famous archaeologist and diver, unearths a killer secret that lies beneath the Venetian waters. When a ruthless mob boss discovers his findings and kidnaps his girlfriend, David must brave the dangerous, shark-infested waters once again to recover the treasure and rescue his girlfriend. A dark and mysterious chase ensues and secrets are revealed in this sci-fi thriller." Sci-fi thriller? Sci-Fi Channel, maybe. Haven't heard about a Sci-Fi airdate as of yet. "SHARKS IN VENICE" stars Stephen Baldwin and Scarlett Johansson's sister, Vanessa. The director is Danny Lerner, himself no stranger to the subgenre having previously directed "RAGING SHARKS" and "SHARK ZONE" for Nu Image, the same company responsible for the Shark Attack trilogy. One look at the trailer for "SHARKS IN VENICE" and you'll see that it looks more than ready to live up to the company's sterling reputation of shark-themed cinema. Synopsis : The seemingly tranquil waterways of Venice are terrorized by the perfect killing machine. In search of his father who has mysteriously disappeared diving in the city, David stumbles across the cryptic trail leading to the long-lost fortune of the Medici. As the unwitting pawn in a Mafia plot to recover the treasure, David's girlfriend is kidnapped at gunpoint, plunging him into a desperate race against time. If he has any hope of saving her he must enter the deadly waters. Can David out-gun the Mafia assassins and survive the voracious sharks laying in wait beneath the surface, or will he succumb to the same fate as his father?